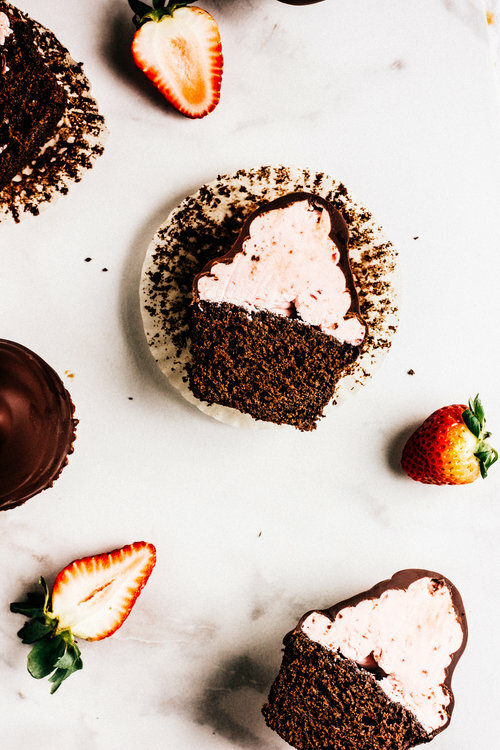 Could there be anything more Valentinesy than chocolate covered strawberry cupcakes? I love love LOVE me some over the top, super cliche pink and red desserts this time of year. I mean, what is Valentine's day for if not to eat as much sugar as humanly possible? For me, February is an excuse to buy as many heart shaped sprinkles as I can and thrown them on everything and everyone I see, both at home and at the bakery. 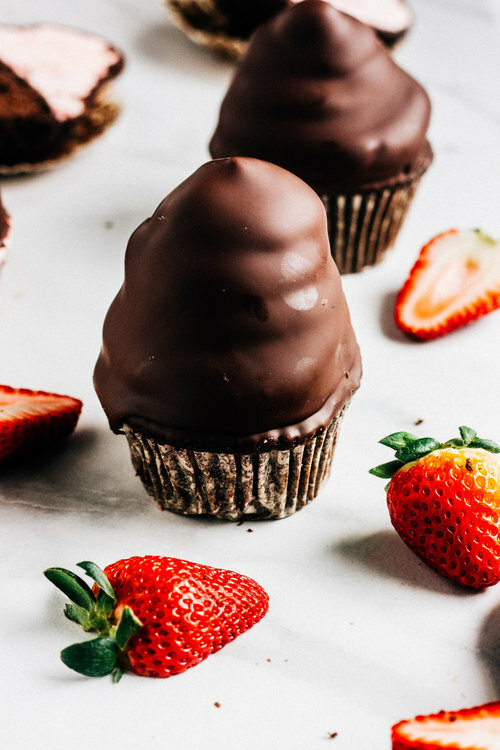 And of course to dip every strawberry (and strawberry cupcake) into a giant pool of chocolate. These cupcakes are something you need for Valentine's Day. Whether you're married, dating, single, making them for the love your life, your dog or yourself, get these going PRONTO. I used a slightly different chocolate cake than I normally do because my go-to cake is a little too soft to hold up a giant mountain for strawberry frosting. This cake is butter rather than oil based and it does the job just right. It's also adapted from Sprinkles Cupcakes so you know it's good. The frosting is a roasted strawberry buttercream and I could eat it by the spoonful. Roasting the strawberries provides a little extra flavor all year round, but it's extra essential at this time of year when strawberries are more like flavorless, watery, sometimes-red-if-you're-lucky, annoyances.But roasting them with a little bit of sugar will bring all of those flavors right to the front and get them ready to make the most incredible frosting. 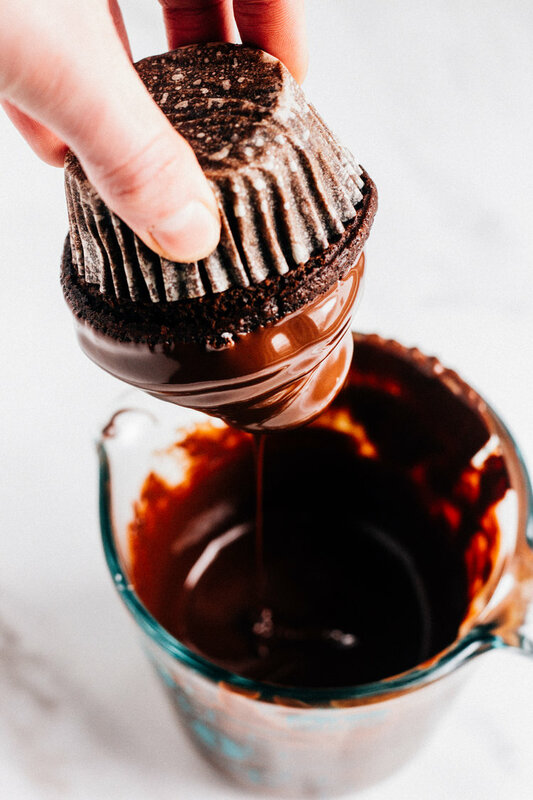 And then the whole things takes a dive into a bath of dark chocolate. 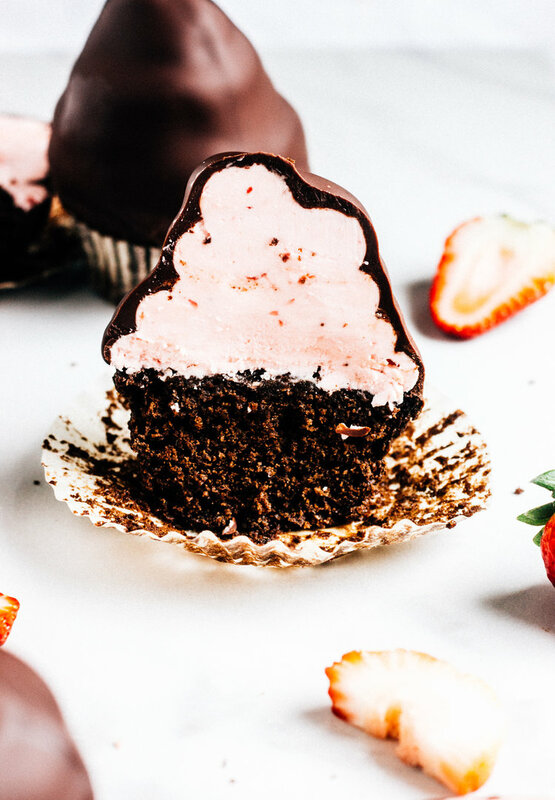 It's the chocolatey, strawberry Valentine dessert of my dreams and I sure hope it makes an appearance at whatever sugar-fueled ragers you have going on next week! 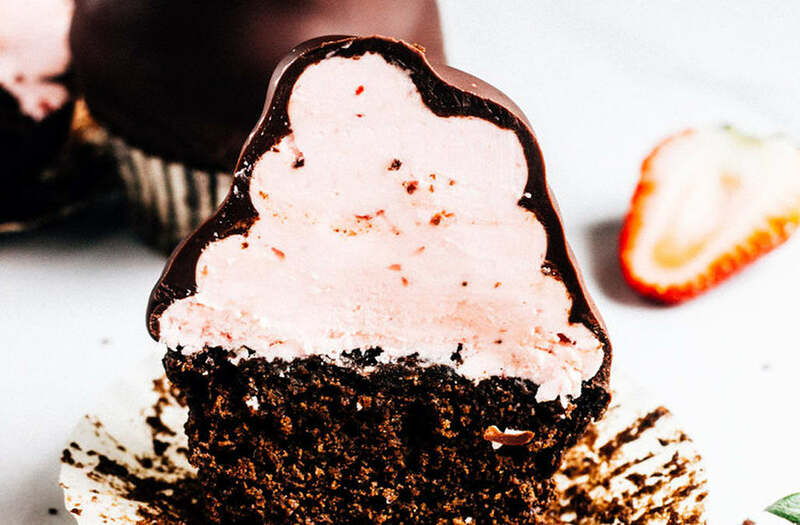 The post Chocolate Covered Strawberry Cupcakes first appeared on The Whole Bite. This stunning cookbook explores the world of exotic spices and flavors that will transform your baking and awaken your senses. Indulge in your guilty pleasures on every special occasion with the most dazzling and delicious dessert recipes and ingenious entertaining tips so you can throw the perfect party. Become a cookie mastermind with these 40 foolproof recipes that require just one bowl, minimal baking equipment, and no previous experience! 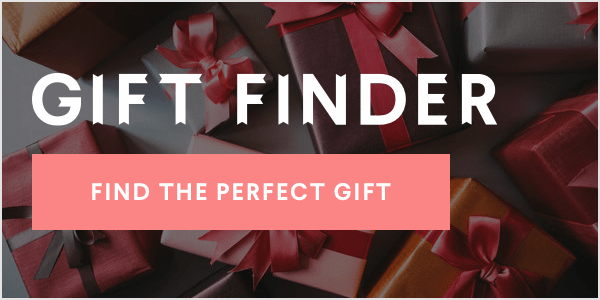 Find all your favorites and new discoveries. This sweet and adorable cookbook features 75 recipes perfect for the holiday season, decadent desserts, and even gluten free treats. This holiday wonder goes beyond vegan basics, taking you on a christmas journey to 125 cookies recipes designed without eggs or dairy products. Gluten free doesn't have to mean taste free. Enjoy over 150 innovative, delicious, and oh-so-sweet gluten free recipes for the holidays. Packed with over 40 delicious and easy-to-follow recipes, American Girl Baking is the best gift for the girliest baker in the family. Sweden's pastry chef of the year in 2014 shares her favorite recipes including chocolate, sugar, butter, cream, and just about every delightful sweet flavor you can think of.